Most people talk about the five essential tastes: sweet, savory, salty, sour, and umami. But there is a sixth taste that makes even a simple chicken dinner something memorable: love. Love is the most powerful ingredient in your kitchen. Love pairs with everything from fish to waffles to tomato soup. Love is more precious than black truffles and lobster. Not to mention way less expensive. Love is always in season and always sustainable. Love is something that everyone can afford, that everyone can share, and that everyone can eat. There are no restrictions on love. And you can never use too much of it. Love is my favorite salt substitute. So before you get carried away with other resolutions this new year, I want to throw something out there — forget about doing more, doing less, doing something specific. And make 2013 about love. It’s a must-have item for any low-sodium eater. Because cooking low-sodium means you are loving yourself. Showing other people how to cook low-sodium for you means letting them love you. And helping low-sodium newcomers tackle the diet with enthusiasm means passing that love forward. Today, the American Heart Association is launching their big 3-Week Sodium Swap Challenge. With blog posts (by yours truly) and an active Facebook page, the AHA is giving the old low-sodium diet a makeover. They are debunking myths. They are focusing on the can do’s instead of the cannot’s. They are motivating newcomers. And giving low-sodium pros, like all of you, a platform to share your tips on keeping a flavorful low-sodium diet. 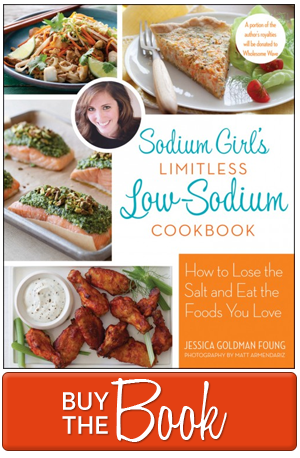 And this month, I encourage you to post, tweet, and shout from the rooftops all the reasons you love low-sodium living. Share your mishaps, share your aha moments, share your favorite grocery store items, and share your favorite recipes — both the ones you’ve made and the ones others made for you. And prove that while low-sodium lacks salt, it is filled to the brim with love. To begin, mix the Chinese five spice, black pepper, and smoked paprika in a small bowl. Then give your chicken thighs a nice massage with the rub and set aside. Heat 1 teaspoon of the sesame oil in a nonstick skillet. When sizzling, add the garlic slivers and let them crisp and brown, watching carefully so that they do not burn, about 1 minute per side. Remove the garlic and let them drain on a paper napkin. With all that garlic infused sesame oil in the skillet, reheat the pan over medium-heat and when hot, add the chicken thighs. Set the timer and cook 15 minutes per side. Meanwhile, place the black rice, yellow onion, grated ginger, garlic powder, and 2 cups of water in a rice cooker and cook (about 20 minutes) until the rice is edible but still has a bit of toothy bite. Fill a small pot with a cup of water and place a steamer basket so it stands just above the water line. Add the bok choy, bring the water to a rolling boil over medium heat, and cover with a lid. Steam the bok choy for 5 minutes and then carefully remove the slightly softened leaves from the pot and set aside. 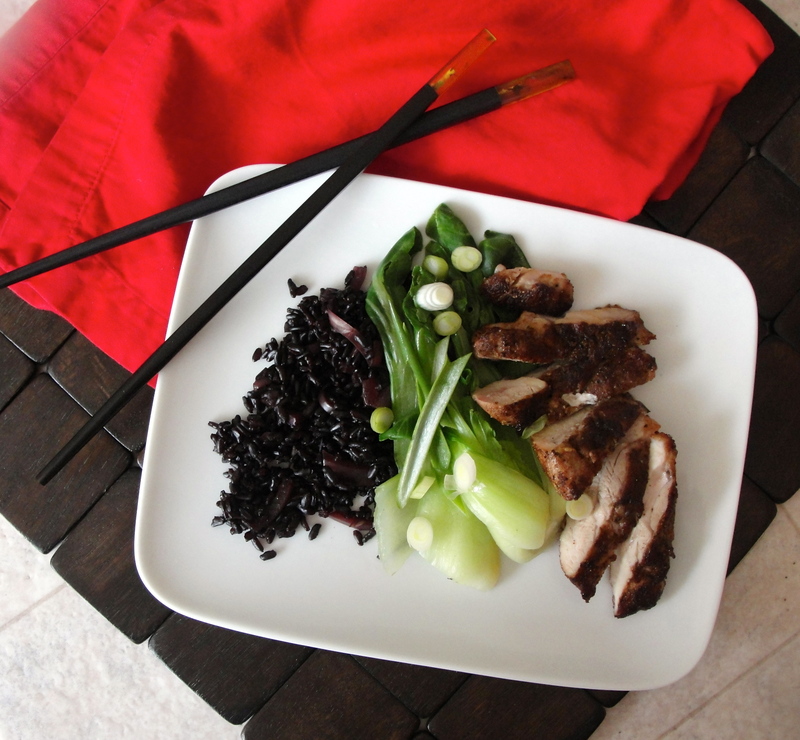 When the rice is cooked, scoop it into a small bowl and add a teaspoon of sesame oil and the rice wine vinegar. Give it a gentle mix until everything is combined. 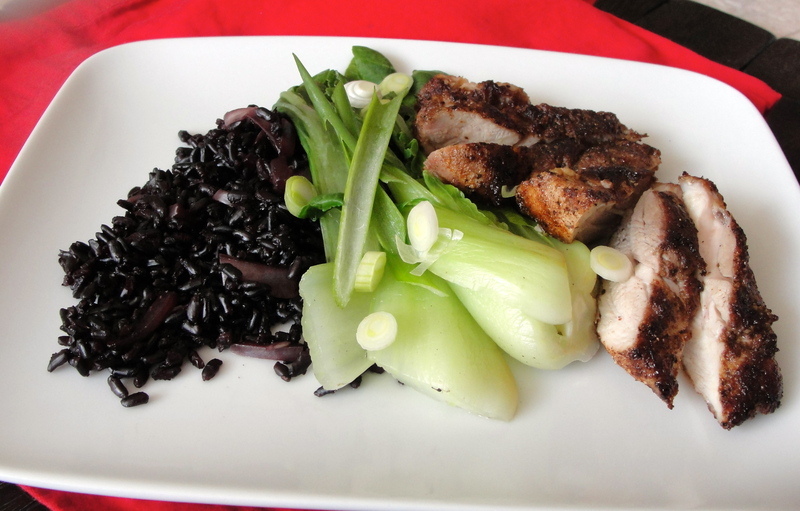 To serve, place the rice onto a plate, layering the bok choy and sliced Chinese five spice chicken over it. Sprinkle with green onions and garlic chips for crunch and serve while warm. Beautifully expressed, SG. Amen and Om. Amen, Jess and Happy New Year! Sister, I too was kicked off the transplant list. My kidneys failed due to complications from surgery and I was on dialysis for 14 months. They miraculously got better. I can’t tell you what a big help your site and the recipes are. It has taught me that creativity can lend a big hand when preparing food. I was talking to a nutritionist and somehow the topic of apple crisp came up. She said “apple crisp is loaded with salt” and I replied, “I bet I could figure out a way to make it so it isn’t”. LOVE this post. And love that you are anti-sodium. We will have to browse some more of your recipes for inspiration while we cook! Looks delicious – love the color on the chicken! Would love to recieve you blog by email. My husband is on lo-sodium diet….heart patient. Hi Claudette! On the right side of the site there is a box that says “SUBSCRIBE.” Underneath that there is a button that says “email.” Just click that button and sign up! And I’ll be in your in-box shortly! Love your site! I am a heart patient. Need low sodium recipies. Please add me to your daily e-mail. Thanks! It’s definitely a great idea to get rid of as much sodium as you can from a diet. This is something that can cause a lot of problems for many people and I think it’s great to have a time devoted to getting rid of it. 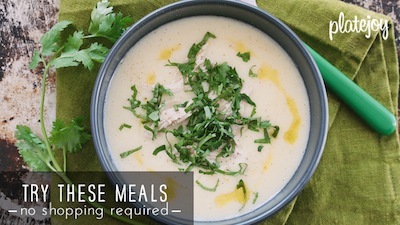 I really like this recipe idea you have as well and think it would be a great date night dish for my husband and I.